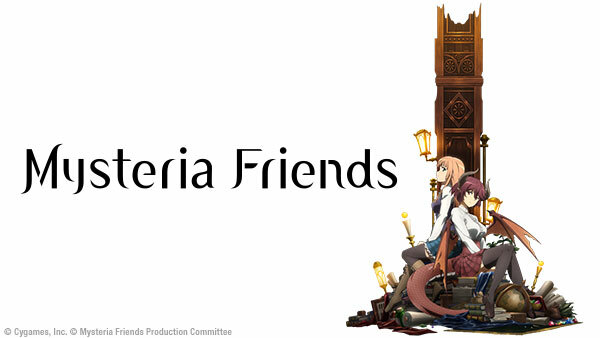 Sign up now to stream Mysteria Friends, subs, tons of dubs, OVA's, simulcasts, plus the all new Dubcast℠ editions and more! It's a girls' day out, so the girls go shopping! But what awaits Grea and Anne at the end of a dark and mysterious alley…? Human princess Anne and dragonborn princess Grea attend Mysteria Academy, a prestigious school for the magical arts. When Grea falls ill with a strange fever, it’s up to Anne to find a cure in the depths of Mysteria Academy’s forbidden library. Not even a princess is exempt from loneliness. Today, the distance between Anne and her peers has never felt so large. Monsters have invaded Mysteria Academy — and Grea is trapped inside the school! Anne wants to come to her rescue… but does Grea actually need saving? White sand, blue waves, clear sky… it’s the perfect day for the beach! But Anne seems reluctant to get in the water. Can Grea help her face her fears? When stage fright gets the better of Grea, it’s up to Anne to calm her down and save the school play. The show must go on! A simple misunderstanding opens a rift in Anne and Grea’s friendship. Will they be able to overcome this hurdle, or will it derail their relationship entirely? It’s the end of the school term, and everyone is heading home. Parting is such sweet sorrow — especially for Grea and Anne.